I was trying to get a reading on my A/C Gauge set but the High Pressure Side port has a rubber piece in it acting like a valve but leaking like crazy. Is this a ford thing? 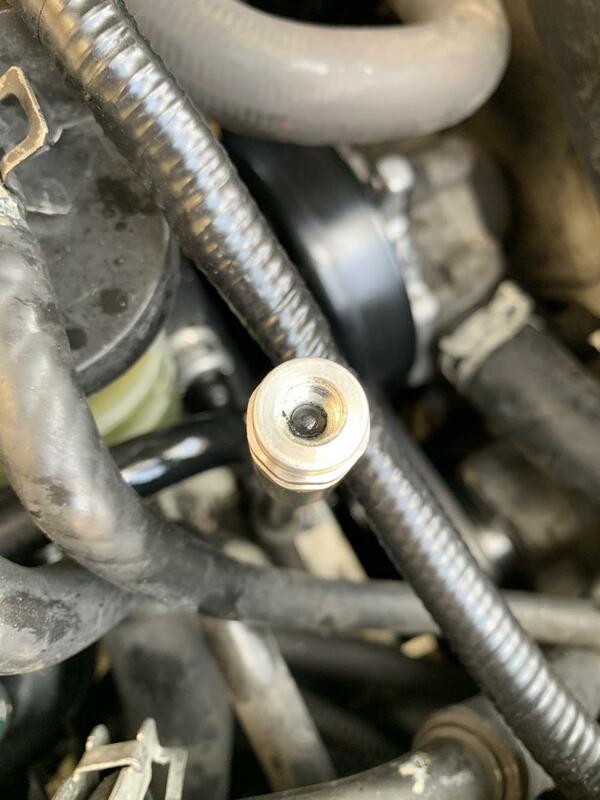 I never seen a R134 quick disconnect internal "valve" like this. Can I replace it with a standard valved port? Maybe a pic would help. Could be a damaged internal valve or the port cap is broken inside the port. I have never had any issues attaching 134a manifold gauges to any of my Fords AC high or low side ports. I will take a look tomorrow but I don't think the black rubber should be there? There are tools to replace the valve cores without losing your refrigerant, had one for R-12. If it is leaking and you try to pry out the black rubber be careful and wear eye protection. That is the high pressure port and is under a lot more pressure than the low side. I don't know where the black rubber came from, almost like a residual from something? Much appreciated. Yeah, I thought it very strange, but no worries, all the gas leaked out due to that rubber piece being there. Never seen a charge / test port that looked anything like that before. Could be a DIY repair of a leaking service port with RTV. They put RTV in and screwed cap into place. What is the history of car?. Well valve has to be replaced, they sell AC valve core remover pretty cheap. Also repair kits. It also may be the rubber seal on the valve dissolving. Yeap, will be doing a port swap with new valve. Probably new expansion valve as well as when I tried to charge the system, High Side only went up to 40PSI. Low side was way too high. Our AC systems dont use an expansion valve, they use an orifice tube. snosaint and Draco911 like this.